Chocolate brownies in New York's Chinatown? Forget that! Planning a trip to New York City? This is one metropolis that does not sleep�things to see and places to go round-the-clock, never a dull moment! Chinatown is a fascinating part of the city. New York boasts it has the largest Chinatown in the United States. Located on the Lower East Side of Manhattan it covers a whopping big 2-square miles and has a population of 150,000 people. Since the 1800's the New York Chinatown area has been home to the highest number of immigrants in the city. In the mid-1800's the Irish, Germans and freed slaves lived here. During the late 1800's and on into the 1900's the next group of immigrants were Chinese, Eastern European Jews and Italians. Today the majority of Chinese are from Toisan, Guangdon, and Fujian Provinces in China. These groups along with the immigrants from Hong Kong, the Dominican Republic, Puerto Rico, Vietnam, Burma, and West Africa combine to make Chinatown a vibrant and engaging city-within-a-city. Economically the area is supported by a flourishing jewelry district that produces 100 million dollars in gold and diamond sales each year, along with hundreds of garment factories with an annual payroll of over 200 million dollars. Yup, 200 million big bucks�now that's a LOT. It's no wonder they have 27 banks to hold all their cash -- the highest bank-per-capita ratio in the city. What more can you ask for? Well, how about thousands of tourists and over 200 restaurants? A whirling dervish of activities � all an absolute must-see for your next trip. If your feet are in tip-top shape and walking is your thing, consider taking a walking tour of the area. Big Onion Walking Tours operate through the fall months and offer a selection of neighborhood walkabouts. 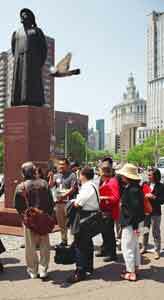 Sites visited on the Chinatown excursions include the Museum of the Chinese in the Americas and the Kimlau Memorial. Jami Gong, a popular local comedian and licensed tour guide conducts tours featuring cultural attractions and tours combined with a tea ceremony, dim sum meal or Chinese feast. Having experienced a tea ceremony along with many meals of dim sum while I toured main-land China I can recommend the above. Dim sum in Chinese means "a little bit of heart" and is the Cantonese term for small dishes. This fascinating cuisine adventure is usually served in the morning or early afternoon and the selections are presented to diners from mobile food carts which travel from table to table. (Picture a portable Chinese buffet.) There are more kinds of Dim Sum than you can count: fish, meat and vegetarian�prepared by steaming (Chinese cooks are big on steaming) or frying. 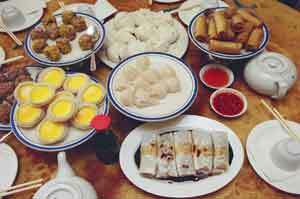 Dim sum selections differ from American foods so expect a new taste-sensation. When I traveled through China I discovered the American need for "something sweet" traveled with me especially when I was in the remote regions of the country where chicken soup was served as dessert. What a shock! Consequently, now when I am on the road working as a travel writer I carry a stash of chocolate in my suitcase. My motto? Always prepared. If you are a chocoholic too and need a sweet conclusion after your evening meal, you should know New York Chinatown bakeries sell a different sort of sweets and savories such as: red-bean flavored, meat-filled or coconut concoctions, sadly, none of which meet the chocolate requirement. What to do? Don't expect to stop in a neighborhood Chinese bakery and find fudge brownies to bolster your sagging spirits. You're on your own. Here's where a small piece of chocolate in your pocket rides to your rescue. It will come in handy as an energy booster too when you are trudging along the streets during a walking tour and your feet are begging you to p.l.e.a.s.e s.i.t d.o.w.n. Last, but certainly not least, Chinatown is a shoppers paradise. Stock up on traveler's checks. Hide your credit cards. This shopping mecca is a perfect opportunity to spend bundles of your money. The green in your wallet�going, going�gone. Expect to find fashion boutiques, general stores and malls as well as markets with fresh produce, martial arts supplies or Chinese traditional medicine�you name it, they have it. This is a great place to buy Christmas or birthday gifts since many of the items sold are unique as well as beautiful. Shoppers have a vast array of affordable gifts from which to choose or�if your check book allows -- ancient, treasured, one-of-a-kind, antique jewelry pieces await your selection. No doubt about it, touring through New York's Chinatown is an experience that will impress even a Texan! Maxine Sommers is a Texas journalist, author and educator. For the past twenty-four years she has traveled extensively throughout the United States, Europe and the Orient and continues to bring her readers the best of her experiences. These fascinating worldwide accounts are factually set forth in various newspapers, magazines, books and a variety of websites. She currently lives in Corpus Christi, Texas. You can reach her at MSommers@interconnect.net.